The couple knew they wanted to marry at a Bijou wedding venue and spent quite a lot of time looking into it. 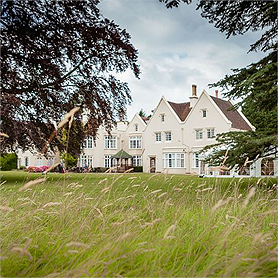 When they found out about a new venue that had become available, Silchester House, they fell in love with it. The wedding venue was light and airy and perfectly suited their rich chocolate brown colour scheme. Matthew and Christina were joined by 106 of their closest friends and family for the ceremony and wedding breakfast, which consisted of a classic three course meal, with two choices for each dish. A further 50 joined them for the evening party, which included a DJ and an American style buffet. The décor at Christina and Matthew’s wedding followed the brown wedding colour scheme. 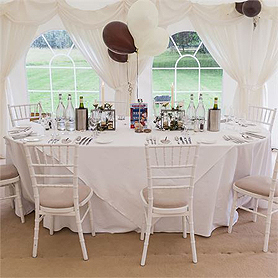 Each table in the marquee reception was decoration with ivory and brown balloons and the centrepieces consisted of repurposed wooden crates with glass bottles filled with brown and cream coloured sand. Ivy and dried flowers were twisted around the frames to give them a more rustic look, and words like ‘Love’ and ‘Joy’ were painted on the sides in calligraphy. They also filled smaller glass bottles with rustic objects in varying shades of brown and added fairy lights for a romantic look. In the evening a DJ entertained the newlyweds and their guests, and played their first dance song which was ‘Turning Page’ by Sleeping at Last. Matthew and Christina made sure their wedding was full of special, personal touches that would entertain their guests. They customised Guess Who games with pictures of their guests and left them on the tables at the reception so they could play as an ice breaker. They also left out Jenga blocks and pens so guests could write messages on them and they’d have a Jenga set to treasure forever. 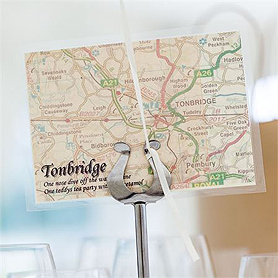 As well as this, the couple made their own table name cards using maps of areas that were relevant to them. Each table name included three facts about Matthew and Christina relating to the area. There was a fingerprint tree guest book and a Polaroid camera and picture booth for the guests to have fun with. As a thank you for their attendance, the couple gave each of their guests boiled sweets and a ceramic heart engraved with their name, which was made by Christina’s godmother. 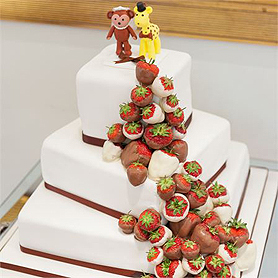 The couple added a fun twist to their traditional style wedding cake by topping it with a monkey and a giraffe made from icing. The cake also featured a cascade of chocolate covered strawberries. Matthew and Christina’s wedding cake was made by their friend Amy, from Making Cakes for You. The top tier was a classic fruit cake, whilst the bottom two tiers were chocolate and Victoria sponge. Although they are yet to go on honeymoon, the newlyweds have three trips planned to celebrate the start of married life! Matthew’s parents treated them to a week in Wales on a narrowboat, whilst his aunt and uncle have promised them the use of their holiday home in Cornwall for a week too. They also plan to visit Venice at Christmas – the most romantic way to spend their first married Christmas!